Trying not to break the bank but don't want a cheap, arcade-looking band for your wedding day? 100S Jewelry's two tone gold and silver band for a bride or groom offers affordable luxury and provides a traditional, yet modern look without appearing fake or wearing away after a few months. Our wide rings are made with thick, cobalt free tungsten carbide for a classic look that is durable and long-lasting. 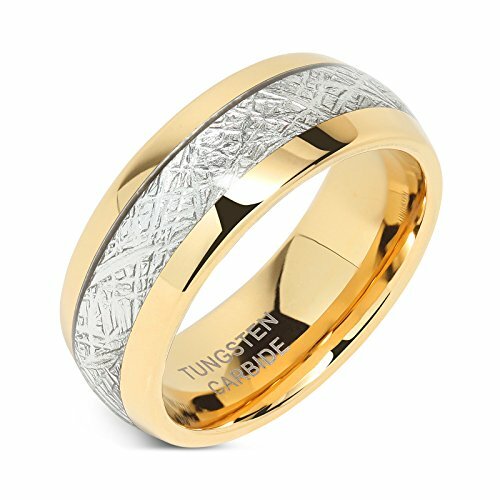 If you're looking for a wedding band that is tougher, stronger and more scratch resistant than traditional gold or platinum rings, our tungsten wedding band is the choice for you. This 14kt gold plated ring with imitated silver meteorite inlay is both scratch resistant & waterproof, so whether you sit at a desk or work with large equipment and heavy machinery, this ring can withstand the elements and continue to look like new overtime. From a small size 5 finger to large size 16 ring fingers, or any half sizes in between, our fancy 8mm band is ideal for a male or female, no matter your hand size. Our aim is to accommodate ring fingers of all shapes and sizes, providing you with a quality band to symbolize your beautiful union. 100S Jewelry's silver & golden band for him or her can be used as the original wedding band on your big day, or can function as an ideal travel replacement ring, so you can keep your existing wedding band safe at home when you're on the road or traveling abroad.